It’s Women’s Week on UFC FIGHT PASS, but UFC women’s featherweight champion Cris “Cyborg” Justino may just want to extend that to Women’s Month, as she defends her title against Holly Holm in the main event of UFC 219 in Las Vegas. For proof why Cyborg and her peers deserve that month, check out her Fab Five. Strikeforce: Carano vs Cyborg – August 15, 2009 (Watch on UFC FIGHT PASS)A pro since 2005, Cris Cyborg lost her debut but then went on a tear that has never let up. A graduate of the revered Chute Boxe Academy, Cyborg first burst on the world scene with her second-round stoppage of Shayna Baszler, and after two more wins, she was matched up with the most well known female MMA fighter in the world, Gina Carano. This was the SuperFight that put women’s MMA on the map for the first time, and Cyborg crushed it, stopping Carano late in the first round. With the Strikeforce women’s featherweight title around her waist, Cyborg continued to dominate, defeating Marloes Coenen and Jan Finney in 2010. Three years later, she would meet Coenen – one of the sport’s pioneers – for a second time, now for the Invicta FC crown at 145 pounds. Again, it was all Cyborg, who stopped Coenen in the fourth round. At that point, Coenen had only been stopped by strikes three times in a career that began in 2000. Cyborg held two of those wins. Following the win over Coenen, Cyborg took a break to visit the world of Muay Thai, and when she returned in 2015, Charmaine Tweet was ready and waiting for her. Unfortunately for Tweet, Cyborg didn’t skip a beat in her return to MMA, as she successfully defended her Invicta FC crown with a 46-second TKO victory. Two more knockout wins followed in Invicta before the UFC came calling in 2016. And despite the UFC not having a featherweight division, a special 140-pound catchweight bout was set for Cyborg to make her debut in her hometown of Curitiba against Leslie Smith. And despite Smith being one of the most durable and gritty fighters in the world, Cyborg was still too much, as she took just 81 seconds to earn her first Octagon victory. 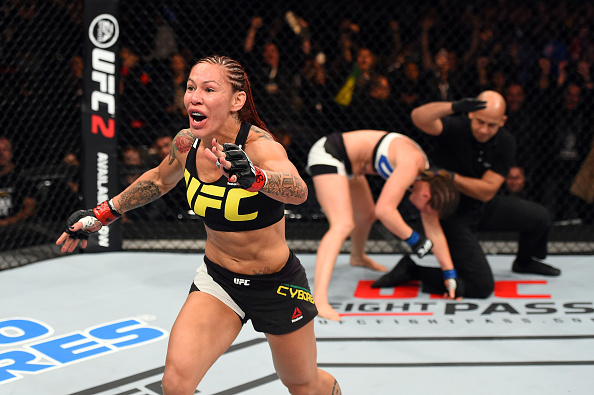 Cyborg’s win over Smith was followed by another catchweight victory, this one over Lina Lansberg in September 2016, but soon, the UFC brought in the featherweight division, and the Brazilian bomber would have a place to call home. The first 145-pound queen, Germaine de Randamie, was stripped of her crown in June of this year, setting the stage for a battle for the vacant title between Cyborg and Tonya Evinger. Evinger was tough, as always, but the night of July 29 would belong to Cyborg, as she stopped Evinger in the third round and became the UFC women’s featherweight champion.